One of the most prominent pre-modern poets. 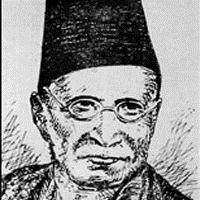 Shad Azimabadi (1846-1927) was born Syed Ali Mohammad in Azeemabad, now Patna. He received traditional education rather early in his life and learnt Urdu, Persian, and Arabic. This was followed by his own studies of Islam and other religions which turned him into a liberal humanist. Although Shad hailed from an affluent family, he cared less for riches, and even lesser for the sources of his future sustenance. Following the general practice of poets in making, he too received counselling on his poetry from several master craftsmen. As he emerged as a poet of remarkable merit and a sound scholar, he earned the title of Khan Bahadur from the British government, with a monthly stipend of a thousand rupees. Shad was essentially a poet of the ghazal tradition. He was no philosopher; nor did he have a taste for stereotypical themes but he distinguished himself on account of his refreshing ideas and novel ways of expression. He engaged with issues in ethics, philosophy, and mysticism, as he deliberated on the unity of God. Following Mir Anis, the celebrated poet of marsiya, he also practised this form. A full time poet and writer, Shad has left behind a huge amount of literary works. Some of them include a biography called Hayaat-e Faryaad, a historical tract called Nawa-i-Watan, collected poems entitled Kulliyaat-e Shad and Maikhana-i-Ilhaam, and an account of marsiya poets, called Fikr-e Baleegh.